Frederick K. Humphreys (1816 – 1900) was a physician and the founder of Humphreys Homeopathic Medicine Company in New York City in 1853. While homeopathic treatments have been scientifically proven to offer no curative benefit to sick humans or animals, enormous sales of Humphreys “Homeopathic Specifics” made him a very rich man. His bottles of veterinary specifics are probably the most common veterinary patent medicine bottle available today, according to the Federation of Historical Bottle Collectors. Endorsed by queens and celebrities, Pond’s Cold Cream and Vanishing Cream were revolutionary products that were aggressively marketed, which contributed to the foundation of the modern cosmetics industry, making proper skin care a vital priority for women of all ages at the turn of the century. According to Ed & Lucy Faulkner, the Carter’s Ink Company was a manufacturer of ink and related products, in Boston and later Cambridge, Massachusetts. It was once the largest ink manufacturer in the world. 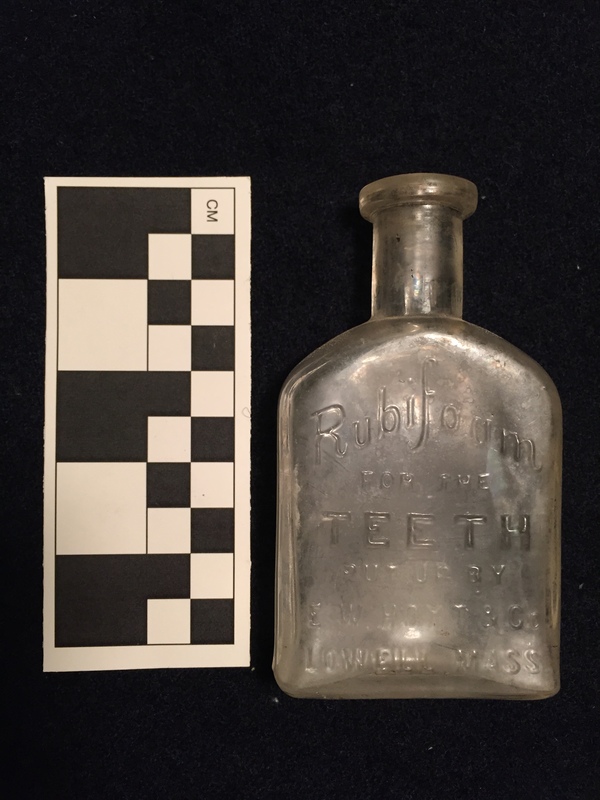 According to Cliff & Linda Hoyt “Rubifoam for the Teeth was sold by E. W. Hoyt & Co. (The name is pronounced like Ruby Foam due to the brilliant red color of the product.) It was introduced in 1887, the same year that E.W. Hoyt died at the age of 49. In addition to trade cards the company also published a number of pamphlets for Rubifoam. The pamphlets typically were providing information on taking care of your teeth.” The E. W. Hoyt & Co. was also well known for producing Hoyt’s German Cologne, which the firm widely advertised with Rubifoam in many decorative and often colorful trade cards, pamphlets and magazines ads.